Buying your first house is very exciting. But financing your home purchase can be a daunting experience. In both cases, do your research and shop carefully to ensure you find exactly what you want and need. Deciding how much to spend on your home and which type of mortgage will work best for you — as well as understanding the settlement process — can be confusing. However, there are many sources that can help you get prepared well before you step foot into a sales office, model home or open house. Get familiar with the lingo. NAHB’s Home Buyer’s Dictionary can help you. Figure out what you can actually afford to pay on a monthly basis. Remember that, in addition to the monthly principal and interest, you will also pay into escrows for property taxes, hazard insurance and possibly a home owners’ or condominium association assessment. You have more knowledge about your living expenses than a lender. Hold firm with that number and don’t be tempted to agree to an amount higher than what you are comfortable spending. Mortgage calculators are a great way to figure out what your monthly payments would be based on interest rates and down payment amounts. Calculators can be found on most real-estate-focused websites. Pay down your debts. Credit card debt limits what you qualify for from a lender. Lenders want to see a total debt service ratio that is less than 40% of your monthly income. Attend a first-time home buying seminar or talk to a credit counselor who does not work for a lender. You can research your options without being influenced by someone who has a financial interest in the home or loan you choose. The U.S. Department of Housing and Urban Development (HUD) offers free housing counseling and seminars. Check out government resources. 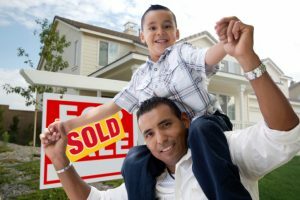 HUD also has a helpful web page, Common Questions from First-time Homebuyers, which provides additional resources for first-time buyers, including special financing options and HUD programs. Select your lender and get pre-approved. When you have done your research and are ready to move on to the next step, visit a lender, understand the loan choices that would be available to you, and, once you’ve determined the most suitable loan, get pre-approved for that loan. Since you will already know how much money you can borrow, you will know what price range you should look at and can move quickly if you are bidding on a house that has several interested buyers. A lender’s pre-approval would still be subject to a final verification of your credit and a satisfactory appraisal, but it’s a big step toward becoming a home owner. For most people, there comes a time when months or years accumulating stuff becomes burdensome and begins to clutter your day-to-day life. It can happen at any age or any time; cleaning out a childhood room and stripping away the reminders of the past can be as difficult for a college-bound young adult as it is for empty nesters who are determined to make the move to a simpler lifestyle in smaller quarters. As soon as you begin to think about making a change, resolve to start sorting and organizing your belongings. If you’re a “pack rat,” it’s going to be hard; know that up front, and don’t put off the inevitable. Spend the time to really examine your motives––both the reasons you saved items in the first place, and your current reasons for disposing of them. Recycle usable items, whether they’re clothes, dishes, books or furnishings. Ask family members if they have an interest first; then hold a sale or donate to a charity or thrift shop of your choice. As much as you may love your high school trophies or your first pair of ballet slippers, your grandmother’s teacups or mementos from long-ago vacations, you will undoubtedly have to hold some of those memories in your mind only. If you’re so inclined, capture such things digitally, but forego the temptation to keep the actual items in your possession. Again, if someone else can make use of the things that you once treasured, it’s a win-win situation. If you’re helping a parent or grandparent downsize, however, you’ll want to make sure that they get the last say in what is important and what should be kept. There might be some movement between the stacks; but the first two categories shouldn’t way outweigh the second two. Think about not only the financial cost of moving your belongings, but also the space things will occupy in your new home. If you will need a storage unit to contain your belongings, rethink your decisions. You’ll be surprised at how free you’ll feel if you make the move without the need for temporary storage, and you have the opportunity to really enjoy and use everything you keep. Resist the temptation to pack up memorabilia with a plan to sort it all out later. Chances are good that you will never open the boxes again, and the burden will only feel heavier as time passes. Never plan to move anything to a new location that you can’t or won’t use. That is an exercise in frustration and futility. Good friends and willing family can lend you physical strength for pulling things out of the attic, up from the basement and off high shelves and. They’ll also give you emotional support, laugh with you and be there in case you want to shed a tear. It’s okay to rely on others, whether you’re looking forward to new adventure or dreading the change. And who knows, what you view as worthless might be your best friend’s dream! Hold a yard sale, but price items to sell. Accept offers just to clear the air, and the yard! Unless you have valuable antiques, chances are you won’t net much cash, but it will be a relief to have things gone. Then get down to the business of organizing the actual move and get on with the rest of your life! 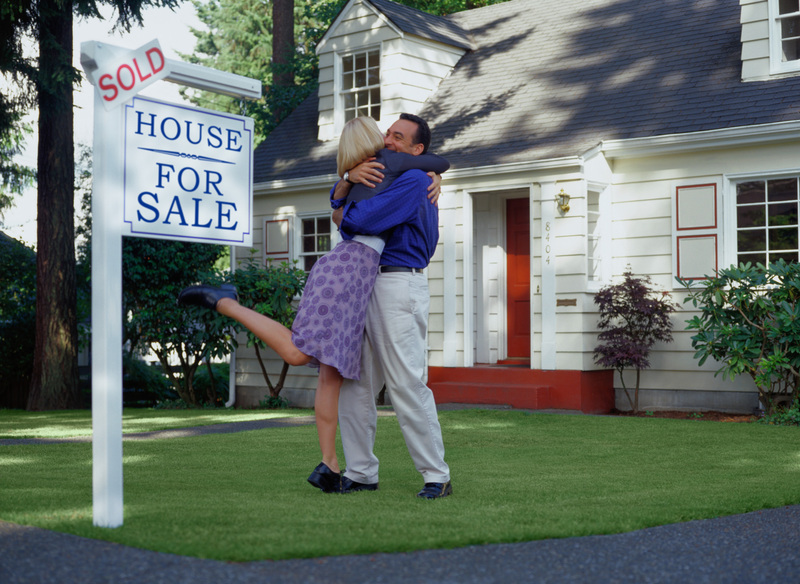 One final tip: Do it all before you list your current home for sale. You’ll want your existing property to shine and look spacious, and clearing out many of your belongings is the best way to do that. Real estate agent Harriet Konter has been honored with a lot of ‘firsts’ in her life. 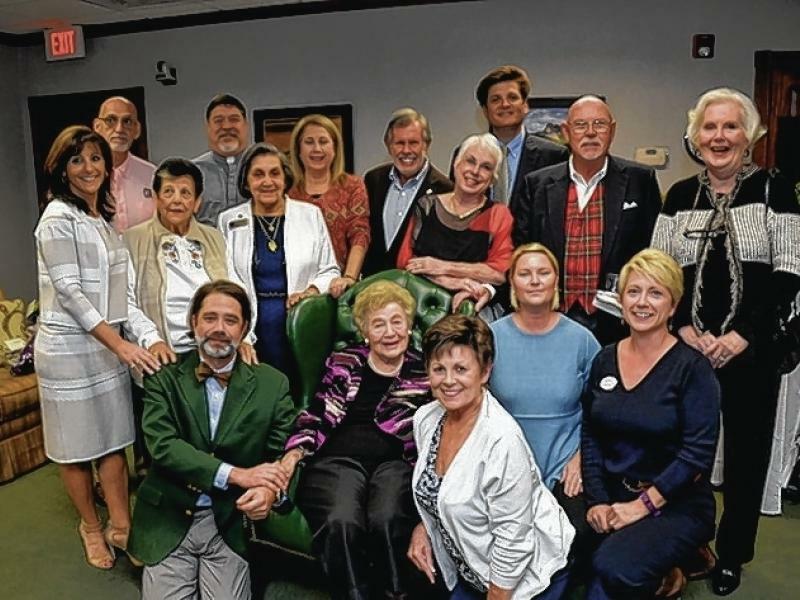 The 92-year-old Savannah native was the first female president of the Georgia Association of Realtors, the first woman to be inducted into the Georgia Association of Realtors Hall of Fame and the first woman to be named “Realtor of the Year” by the Savannah Area Realtors, but those who have worked alongside Konter, said she’s always put their needs ahead of her own. “She leads through example and by that I mean that she’s always lives by the golden rule, she treats people the way she wants to be treated and she’s always lead through honestly, trust and integrity and through that she’s definitely the epitome of what it means to be a Realtor,” said local agent Steven Fischer. 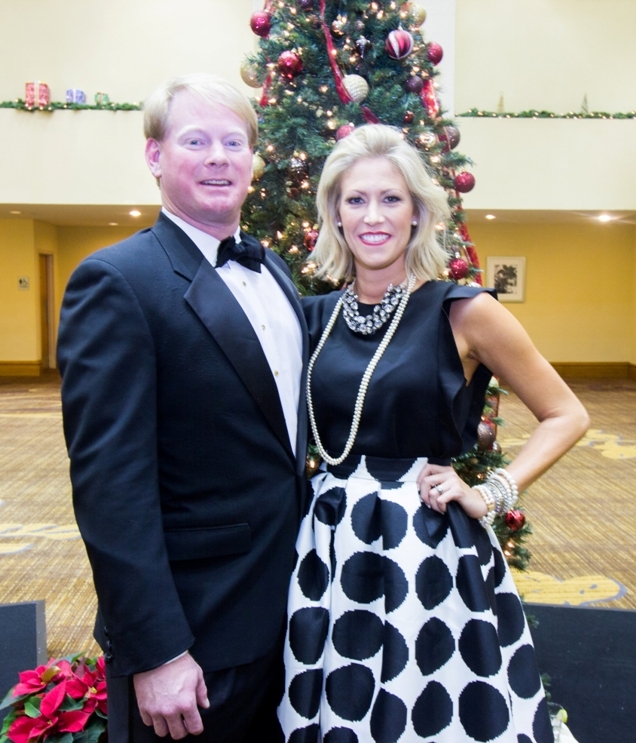 Konter and her late husband, Larry Konter, founded Konter Realty Co. in 1961 in a small two-room office in downtown Savannah. Six individual companies now operate under the Konter Co. umbrella, including Konter Quality Homes, which was founded by the Konter’s son, Jerry Konter, in 1977. 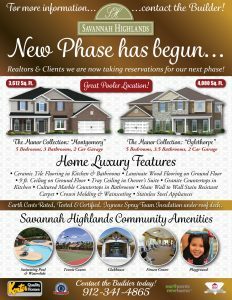 Together the companies have built and sold thousands of homes across the Low Country and created 17 communities, including Savannah Highlands and Woodland Trail in Richmond Hill. After Larry Konter died in 1995, Fischer said, with all that the couple had already accomplished it would have been easy for Harriet Konter to retire, but he knew she’d continue building on what she and Larry had worked so hard for. “It was always Larry and Harriet… She had already been No. 1, she had the biggest company, but there was never a doubt in my mind that she was going to continue the company and she did, which was very impressive,” Fischer said. 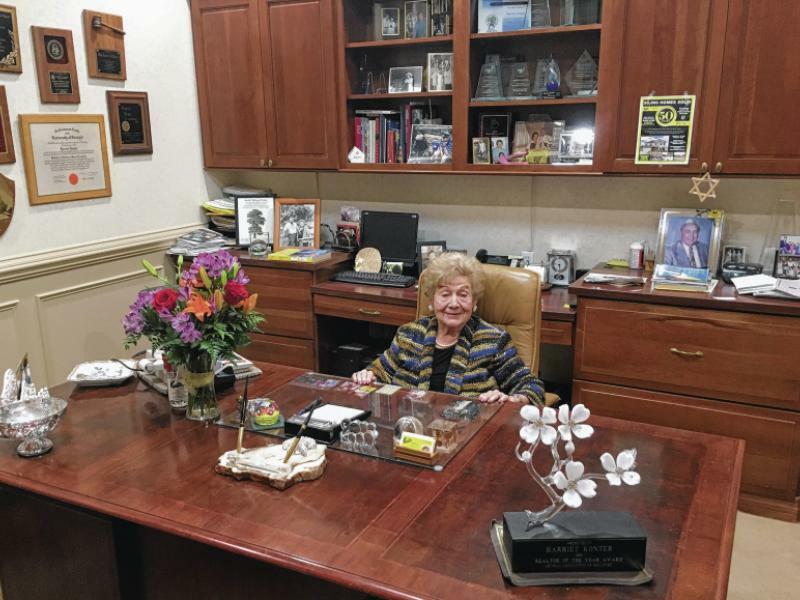 “And I’m still here,” Konter interjected, smiling from behind her desk in her midtown office, where a group of friends and family gathered last week to share stories and laughs about her time in the industry, which spans more than 50 years. “I have wonderful friends and we’ve been out there a long time,” Konter said. Another one of those friends is Gale Hirsh. About 16 years ago Hirsh was using Konter’s office phones for a fundraising effort when Konter persuaded her to obtain her real estate license. “(Harriet) said, ‘hang up the phone’ and she closed the door,” Hirsh laughed. Hirsh is now the residential sales manager for Konter Realty, but her connection with the Konters began at a gas station while she was still living in New York, years before she met the couple. “My husband’s company was being relocated (to Savannah) and I was leaving everything and I was just down … I went to a gas station to fill up and the guy pumping gas, I don’t even know who he was, asked me what was wrong,” Hirsh said recalling a conversation she had with a gas station attendant. After explaining that she was moving to Savannah and didn’t know anyone here, the attendant offered some advice. “You know what he said to me?” Hirsh asked the group. Lisa Neville’s journey with Konter started in high school, and this year she celebrated her 41st year working as support staff with the company. “I came after school, then went through college, went through a marriage, went through a baby and I’m still here,” Neville said. One memory retired Realtor Bob Bennett will never forget is when his daughter, Robin Lance, was to be installed as the president of the Georgia Association of Realtors in 2013. 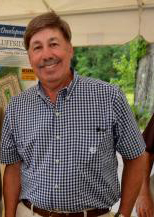 Konter gave Bennett and his wife, Roberta, who was also a Realtor, the honor of installing Lance. “She wanted Roberta and I to install our daughter and it was great and we’ll always remember that,” Bennett said. Lance had previously asked Konter and three other past female presidents, whom she had formed a close relationship with, to install her, but Konter had other plans. “Harriet accepted my invitation, but, without my knowing it, went to my parents and said she felt it would mean so much to me if they actually installed me,” Lance explained. 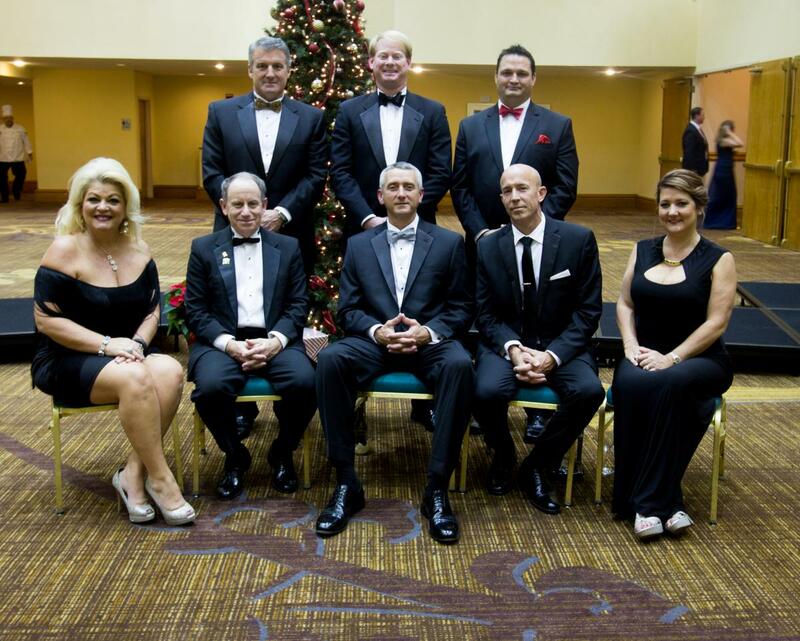 Recently, Konter was honored by the Savannah Area Realtors for her service and dedication to the Savannah industry. With that honor came another first: Konter is the first woman to have her portrait displayed at the SAR boardroom on Hodgson Memorial Drive. “I was overwhelmed,” Konter said of the reception and presentation. And Fischer said the large gathering was a testament to the impact Konter has made on so many and the respect that they have for her. “Wherever she went she made an impact, sometimes because she didn’t whisper, but she still made an impact,” he laughed. 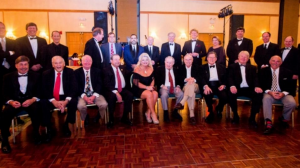 Over the years Konter has served as president of the Armstrong State University Alumni Association, director of the Savannah Jewish Community Center, director of the National Association of Realtors and the list goes on. 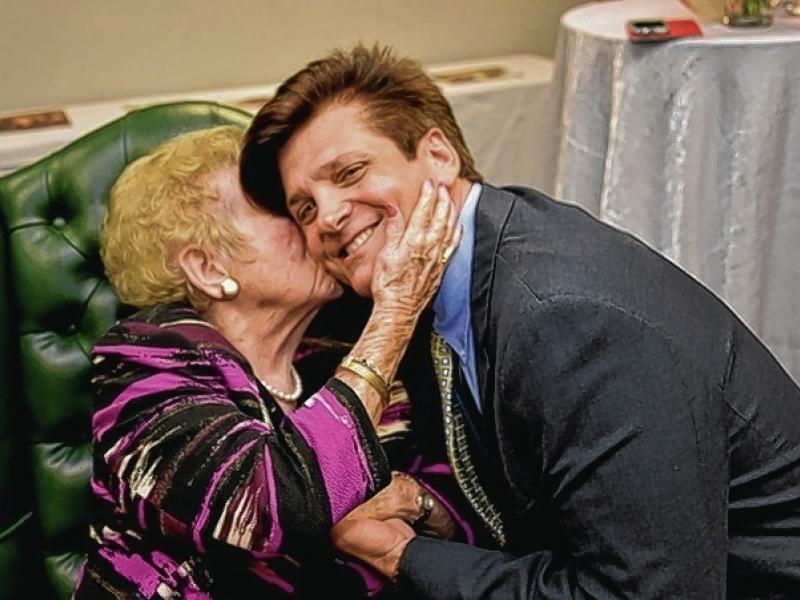 She’s still involved in many organizations including the Women’s Council of Realtors and the local, state and national Association of Realtors, but at the heart of it all for Konter is her friends, colleagues and family. “I love everything about it,” Konter said of her career. Hardwood floors are traditional and remain one of the most elegant culls due to their shine, natural texture and variety of stains / culminates. They are durable. If installed and maintained properly will last the lifetime of the home. Wood floors are more sumptuous to purchase and harder to install then other flooring options. This is often the most prevalent deciding factor in determining whether it’s the right cull for a home. For homes built in Coastal Georgia, an engineered wood would be the better option as it holds up better in humidity. Laminate has become very popular as a substitute for wood flooring. If you dote the look of wood but want something more affordable and more facile to install, laminate is a great option. Laminate is more durable, easy to clean and withstands scratches and dents much better than hardwood. It is however harder to rehabilitate. Planks may have to be abstracted and superseded whereas in hardwood a defect could be sanded out and refinished. 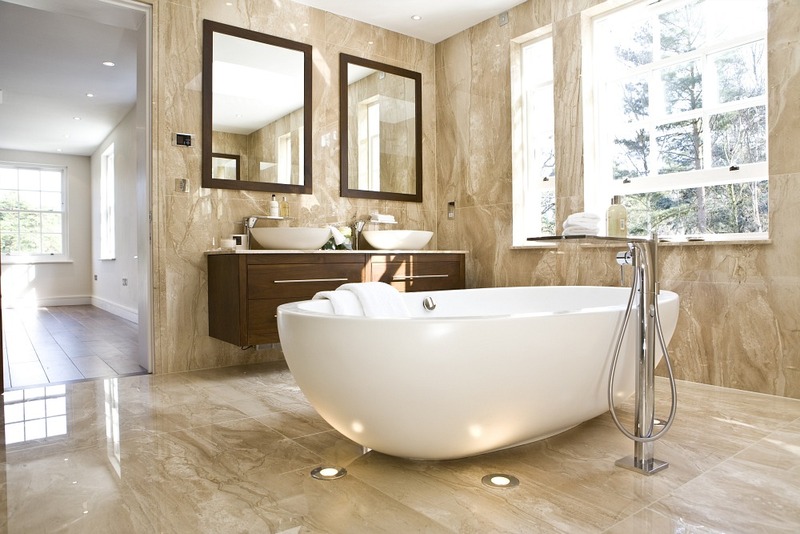 Ceramic tile can be visually perceived from bathrooms to living rooms. It is facile to clean and maintain while integrating a sleek finish for more contemporary homes. Ceramic may not be a good option for areas where children play and are prone to falling because of its hardness. Homeowners in warmer climate areas like Georgia incline to choose ceramic flooring as it feels cooler to the physical contact. Ceramic tile can also be slippery. Picking a tile with some texture may be best for homes where slips and falls are a concern. Vinyl and Linoleum are terms that incline to be interchangeable but are in fact two variants of material. Where Linoleum is a product made from natural materials and oils, vinyl is made with synthetic products. These type of flooring options come in astronomically immense sheets or squares with a wide variety of patterns. They are fairly facile to clean and hold up well in heftily ponderous traffic areas. The kitchen is a mundane place to optically discern this type of flooring but it is congruous for other areas such as bathrooms and laundry rooms. One of the most immensely colossal perks to vinyl and linoleum is the affordability. While wall to wall carpet is not as popular as it once was in homes, it is still a great option for homes wanting comfort. Carpet is very easy to install and decently priced. It may not require to be cleaned as often as a hard surface, but it is remotely harder to maintain in terms of stain abstraction and annual steam cleaning. Homeowners who cull carpet often choose it because of the comfortable setting it engenders while reducing the noise of walking that harder surfaces would create. Allergy and Asthma sufferers should note that airborne particles incline to stick into carpet fibers. Customary vacuuming can help minimize the issue but it will not eliminate it entirely. Marble, travertine, granite, limestone and slate are all examples of stones that can be utilized in flooring. They give a luxurious feel to a home with a beautiful texture and culminate. 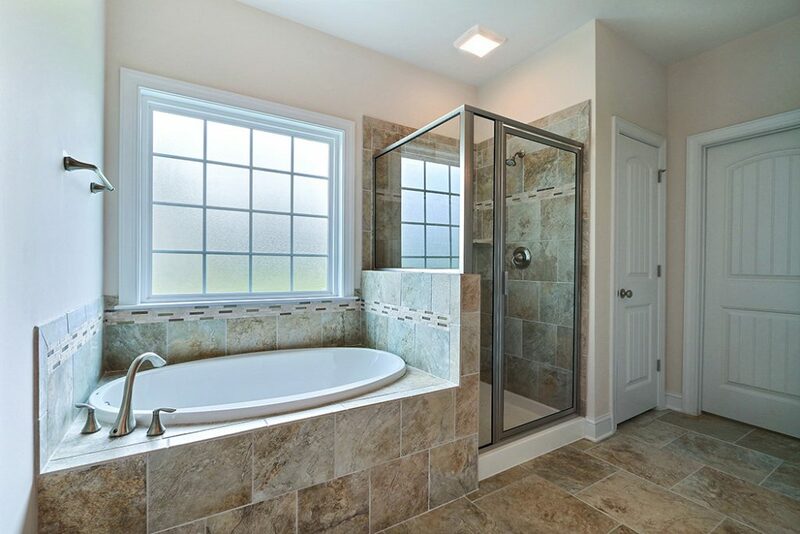 Like ceramic tile, stone has a cool property that makes it another great cull for Georgia homes. They are perdurable and are considered a lifetime flooring. 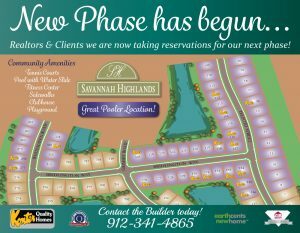 Realtors & Clients we are now taking reservations for our next phase! 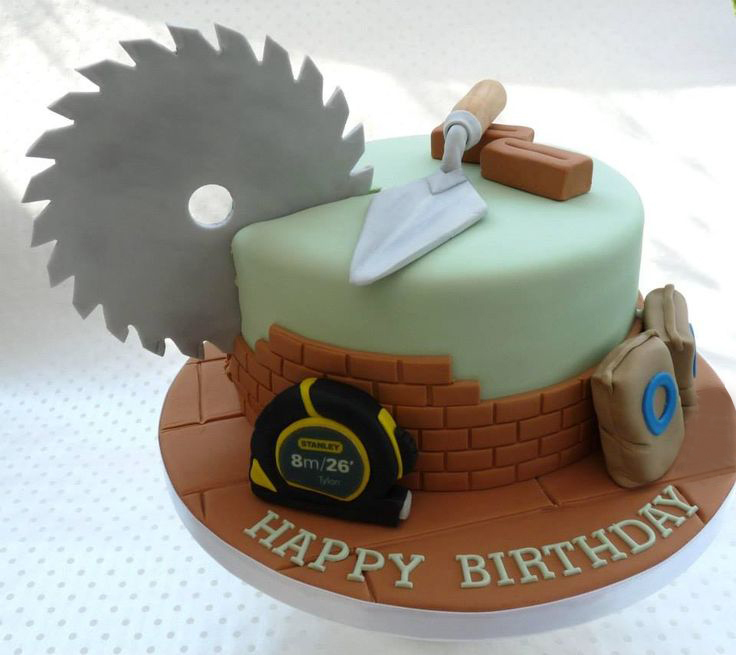 Jerry Konter a Happy Birthday today!!! From all of us at Konter Quality Homes, have a wonderful day!! 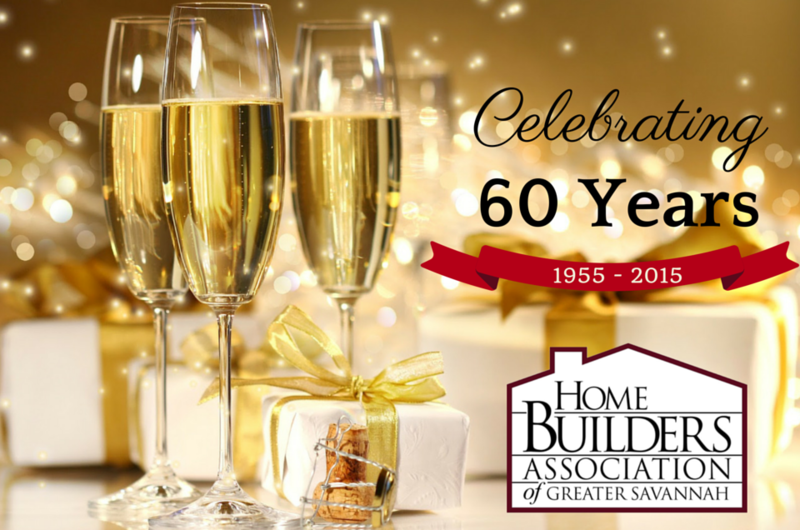 In June, 1955 Judge David Atkinson of the Superior Court of Chatham County signed the order which created the Home Builders Association of Savannah. 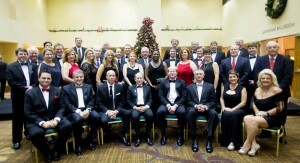 The Association started with 27 Charter members and today stands strong with over 400 members. 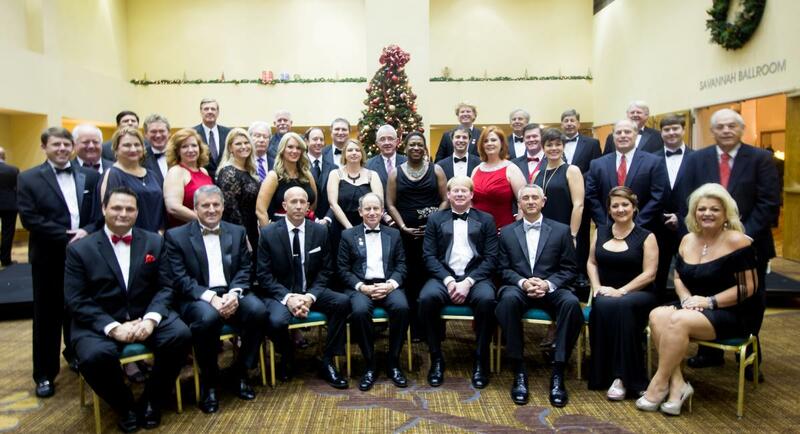 Since its inception, the Association has had 59 Presidents including our current President, Mr. Kevin Kirsch. 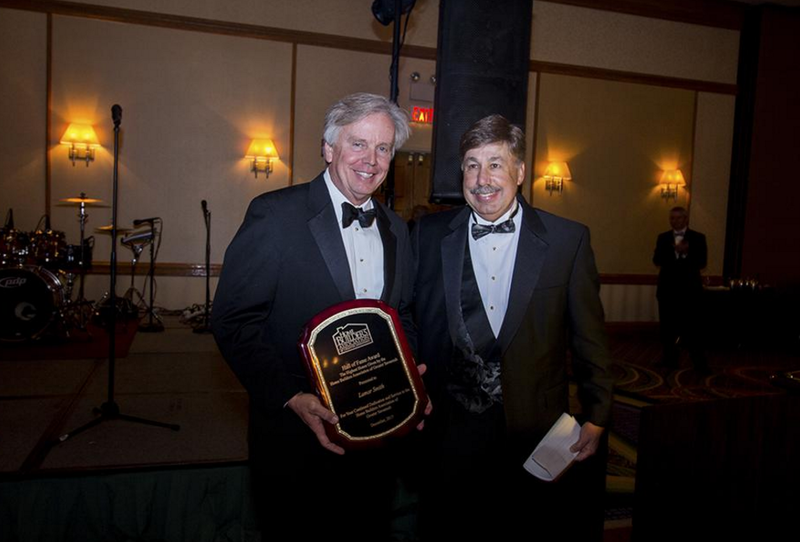 The Association has grown tremendously over the past 60 years. We now have 3 Chapters and over 15 different committees and councils. We have a Government and Regulatory Affairs Committee in addition to an Engineers and Developers Council who works directly with City and Council Officials to help shape the way developing will take place in the future. 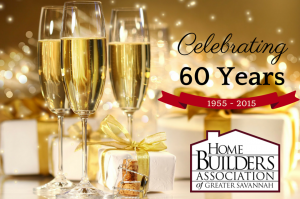 In recent years the HBA has had many exciting developments. 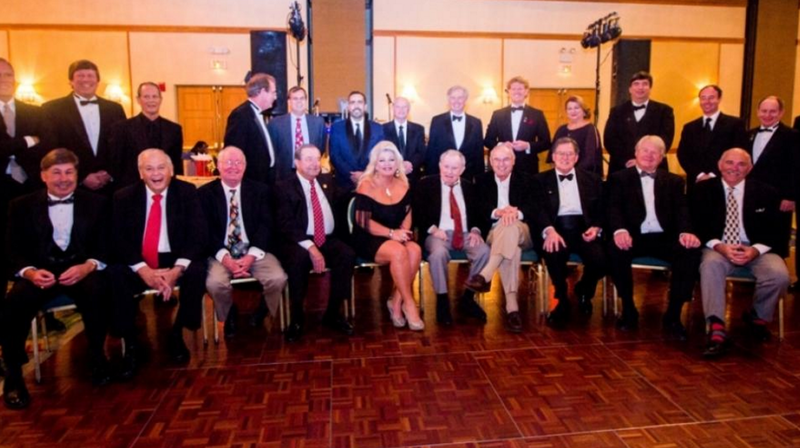 1998 we developed our Effingham Chapter and a few years later, we developed our Bryan County Chapter. 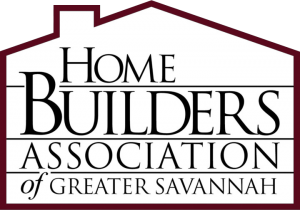 It was at this point that we legally changed the name of the Association to the Home Builders Association of Greater Savannah. In July of 2000 we moved into our brand new 4000 SF Office Building which houses our staff of 2. The debt free building was built and paid for by the dedicated Members of our Association. The Camden is a beautiful large family home. The 1st floor features a wonderful open design with large chef’s kitchen featuring an island that will seat the whole family! A dining room and living room anchor the front portion of the home and a large family room opens to the kitchen, allowing you multiple entertaining options. The ground floor Owner’s suite includes a large walk in closet and luxury bath with shower and separate garden tub. The 2nd floor features a large loft/bonus room and four bedrooms. with two additional enlarged bathrooms. The Camden includes spray foam insulation and is Earth Cents rated helping you to save money on your utility bills immediately!! 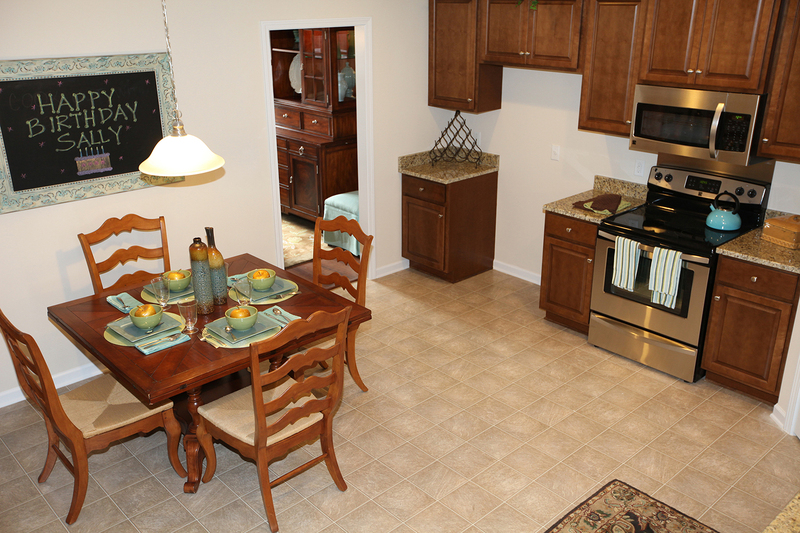 Check out our Camden Floor Plans – click here!! 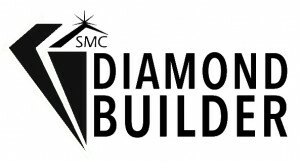 Check out our Move-in Ready homes – click here!! The Walton is beautiful two story home that features four bedrooms 2.5 bathrooms and a large bonus room. The Walton features Icynene spray foam insulation, and is Energy Star certified. 9′ ceilings and an open kitchen and great room give the Walton a spacious open feeling. The Owner’s bathroom includes dual vanities an enclosed toilet space and a large walk in closet. 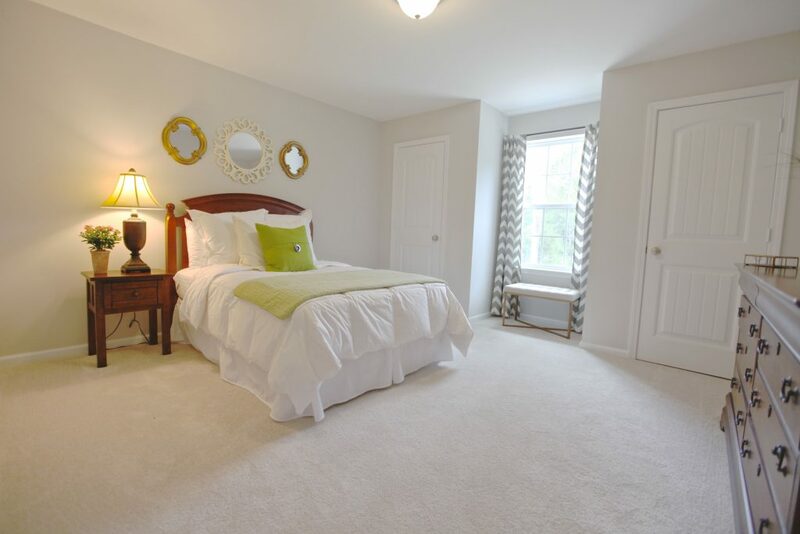 The second floor features 3 additional bedrooms each with a walk-in closet as well as a large bonus room. 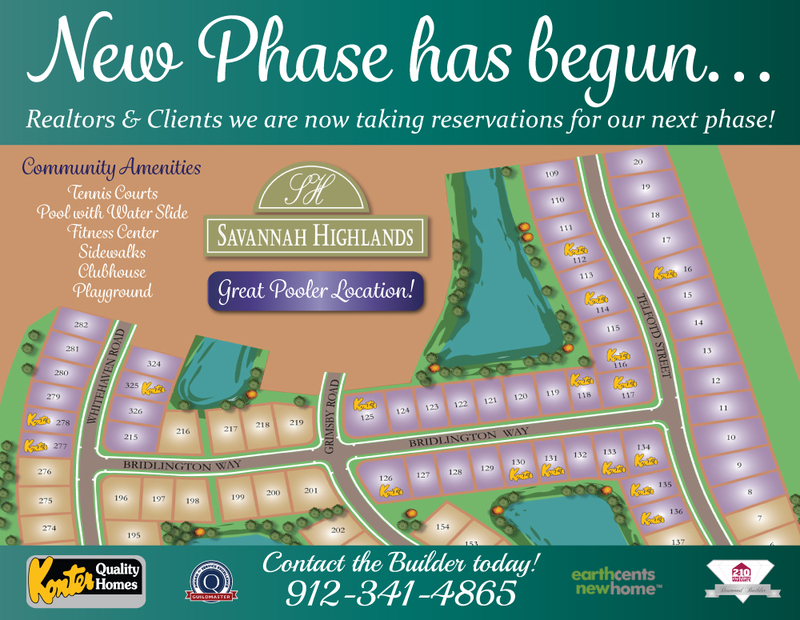 Check out our Walton Floor Plans – click here!! The Oglethorpe by Konter Quality Homes is the perfect home for your growing family. At over 4000 square feet this grand estate features large open living spaces, quality craftsmanship and keen attention to detail. A delightful foyer offers a warm and inviting entrance into this home with views of the adjacent elegant dining room and formal living room. 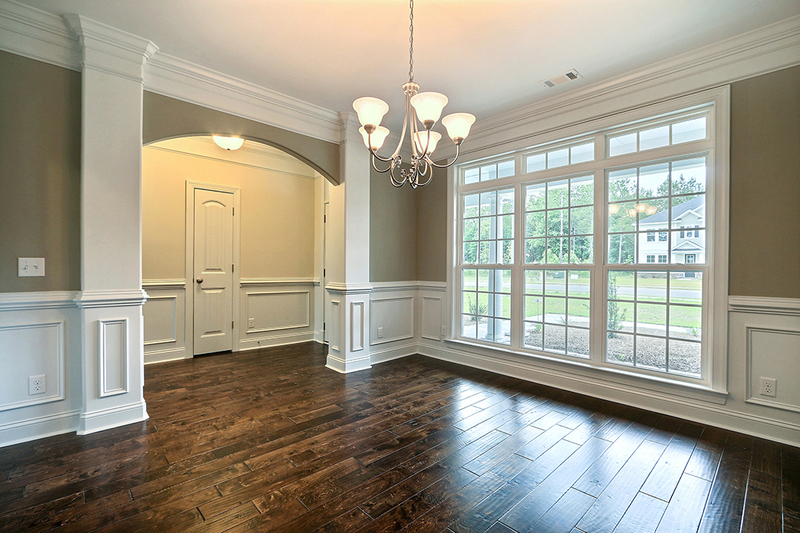 While extensive crown molding, dramatic custom trim details and wood flooring add character to the Oglethorpe’s fabulous living spaces. 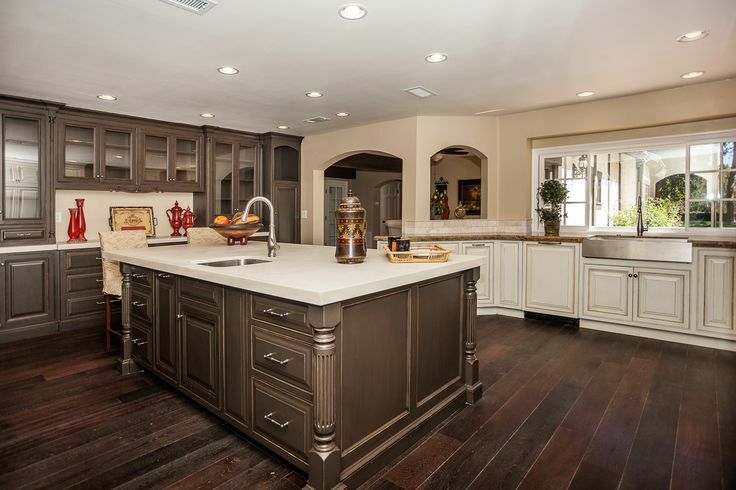 Granite counter tops enhance the chef inspired kitchen that boast modern appliances and tons of cabinet space. Retreat upstairs to reveal a massive bonus room that’s perfect for a play area, media room or both.This home wouldn’t be complete without an abundance of spacious bedrooms exemplified by the large owners suite. Featuring a cozy sitting area and tray ceiling the owners suite radiants tranquility. While the luxurious owner’s bath whose spa inspired features promote an aura of relaxation. Spacious open concept living and exceptional craftsmanship give this grand estate every feature the modern and growing family needs. And at Konter Quality Homes quality isn’t just in our name.. it’s in every home we build. 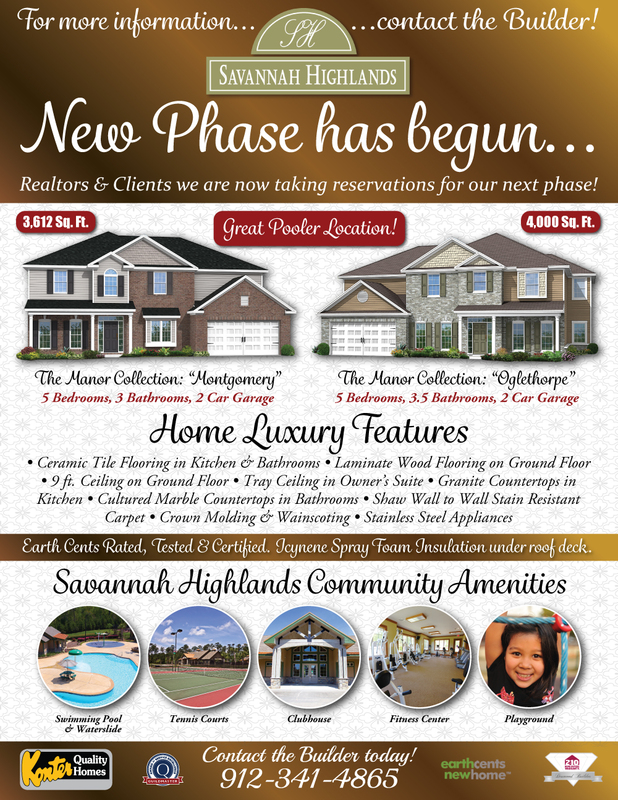 Check out our Oglethorpe floor plans…click here!